Anyway – in the spirit of some really good cheer, I’ve decided to put aside any pet issues of mine for today and rather focus this page on the looming season of goodwill…especially since this is about the time our kids start planning their letter-writing to Santa and millions of parents around the world begin to – yet again – perpetuate a traditional “myth”, as will be debunked here! THE TRUTH ABOUT SANTA – HILARIOUS SCIENTIFIC REVIEW! Here below is a brilliantly, witty piece on the myth of Santa, ‘lifted’ from the Briefcase column in Business Times (Sunday Times – South Africa – 17 December 2000). It’s a lengthy read, but hilariously clever. Certainly well worth a few minutes and it will save you future letter writing time to Santa anyway! No known species of reindeer can fly. BUT there are 300 000 species of living organisms yet to be classified, and while most of these are insects and germs, this does not COMPLETELY rule out flying reindeer, which only Santa has ever seen. There are over 2 billion children (persons under 18) in the world. Since Santa doesn’t appear to handle the Muslim, Hindu, Jewish and Buddhist children, that reduces the workload to around 15% of the total – 378 million according to the Population Reference Bureau (1999). At an average census rate of 3.5 children per household, that’s 91.8 million homes. Santa has 31 hours of Christmas to work with, thanks to the different time zones and rotation of the earth, assuming he travels east to west (which seems logical). This works out at 822.6 visits per second. The payload on the sleigh adds another interesting element. Assuming each child gets nothing more than a medium-sized Lego set (900 grams), the sleigh is carrying 340 000 tonnes, not including Santa, who is invariably described as overweight. On land, conventional reindeer can pull no more than 135 kg. Even granting that “flying reindeer” could pull TEN TIMES the normal amount, we cannot do the job with 8, or even 9, reindeer. We need 214 200 reindeer. 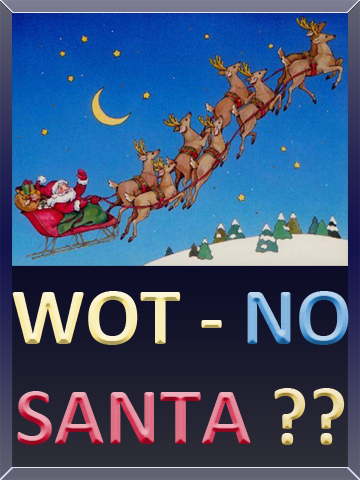 This now increases the payload – excluding the weight of the sleigh itself and the reindeer food – to 374 000 tonnes. A weight of 374 000 tonnes travelling at 1000 km per second creates enormous air resistance. This will heat the reindeer up in the same fashion as spacecraft re-entering the earth’s atmosphere. The lead pair of reindeer will absorb 14.3 QUINTILLION joules of energy. Per second. Each. In short, they will burst into flame almost instantaneously, thereby exposing the reindeer behind them to the same fate. Deafening sonic booms will erupt in their wake and the entire reindeer team will be completely vaporized in 4.26 thousandths of one second. Meanwhile, Santa will be subjected to centrifugal forces that are 17 500.06 times greater than gravity. Assuming Santa weighed 110 kg (which seems ludicrously slim), he would be pinned to the back of his sleigh by 1 925 000 kg of force. So folks – that’s the reason why there is no Santa Claus. Thank you to whoever wrote this brilliant piece originally! Plus whoever originated the graphic I’ve used here. To all the parents who now read this…I understand there’s a team of scientists researching the behaviour of flocks of storks around the world which, it is alleged, are responsible for delivering all the new little baby brothers and sisters daily. If there’s any empirical evidence this might also be a myth, I’ll certainly post it here, too. P.S. If anyone knows of any team of researchers investigating bunny rabbits that deliver eggs made of chocolate at Easter-time each year, I’m also keen to learn of any scientific findings they might make in this regard.